Where in Canada is Mr. Mahmoudreza Khavari ? Based on privacy act of Canada,it is difficult to get information from Canadian Government officices including Immigration and Ministry of Foreign Affairs. One possibility indicate that; he is living with his family in Richmond Hill area ,the suburb of Toronto. According to one source, several years ago a company was registered with the name of M.R. Khavari and the name of the company was " Soaring Properties" in Toronto. It would be wiser if Mr. Khavari speak to canadian Media about the whole situation surrounding 3000 billion Tuman financial embezzlement.Now that he has decided not to return to Iran( He suppose to return to Iran at 2 Am today), and based on Mr. Gholamhosein Ejeei Iran's public prosecutor general, all the blames now fall on him. programe at Lahe Court of Arbitration. - M.A in Law, Shahid Beheshti University Faculty of Law. - B. A in Law , Tehran University , Faculty of Law and Political Science. - Chairman of the Board and Managing Director of Bank Melli Iran. - Board Member and Deputy of Managing Director of Bank Sepah. - Vice Chairman of the Board of Directors & Deputy Manager of Chadormalu Mining & Industrial Co.
- Consultant of Manager of National Iranian Steel Co.
- Board Member of Bank Sepah. - Litigation Department Manager of Bank of Industry & Mine. - Expert of Bank of Industry & Mine. - Expert of Tehran University . - Membership in Committees of Bank Sepah & Bank of Industry and Mine. Company , Gole Gohar Iron ore Company and Sepah Brokerage. - Member of the Board of Directors in Tehran Stock Exchange. Transactions published by Banking Training Center which is reprinted . Address: Bank Melli Iran Central Depts,Ferdowsi Ave.
For Immediate ReleaseIran: Christian Pastor Faces Execution for ‘Apostasy’Evangelical Christians Targets of Religious Persecution (New York, September 30, 2011) – Iranian authorities should immediately free pastor Yousef Nadarkhani and drop all charges against him, Human Rights Watch said today. Nadarkhani, who has been charged with apostasy and is in Rasht prison in northern Iran, faces possible execution.Nadarkhani, 33, went to an appeals court on September 25, 2011, in response to a summons, said his lawyer, Mohammad Ali Dadkhah. Court officials told him that he had three opportunities to renounce his faith and embrace Islam. The last of the three court sessions, on September 28, ended with Nadarkhani refusing for the third time to recant. A Supreme Court ruling in June had overturned an earlier death sentence against Nadarkhani for apostasy, and ordered the lower court to conduct additional investigations to determine whether Nadarkhani was willing to renounce his Christian faith to avoid execution. Hamid Reza Fouladgar an MP in Majles about the 3000 billion tuman embezzlement: Removal or resignation of those responsible is not enough ! So far three major Banking managing directors have either been removed from their post or resigned.!!??!! Mr. Hamidreza Fouladgar an MP and a member of the commission on article 44 said to reporters that: Removal and resignation is not enough ,if there were shortages it must be clarified ! "Not only the Minister of economy and Finance but also the Cental Bank of Iran was responsible in this embezzlement." said MP fouladgar.He added; the reason behind the criticize by the members of parliament is because , the Government and the Central Bank were supervising the Banking system in the country. he said: This is the biggest embezzlement in the history of the country and the parliament must do the investigation and speak about it and use the impeachment tool. Earlier , some members of parliament proposed to call Ahmadinejad to parliament for questioning,so far it didn't happen yet!!??? One MP namely Motahari threatened he will resign if Ahmadinejad not brought for questioning . He criticized Ali Larijani the speaker of the parliament and his deputies for delaying the process. In another news Mr. Ali Akbar Javanfekr media advisor of Mahmoud Ahmadinejad said: The parliament and the Judiciary Power acted carelessly in embezzlement. According to Fars News Agency ,Mr. Javanfekr said that ; the 3000 billion Tuman embezzlement is the result of carelessness on the side of Judiciary power and parliament.Because the accounts auditing and inspector general supposed to do their job and they were careless. Mr. Javanfekr also disclosed about a corrupt business deal by"Sherkate Maskan va Sakhtemane Jahan " ( Jahan residential building construction ) which works under the city of Tehran (City Hall in Tehran). Mr. Javanfekr believes that; this company is also using unhealthy and corrupt way of business, doing damage to countries economy. "The year of Economy"began with the theft of greatest financial embezzlement in the history of Iran(3000 Billion Tuman from the Banking system )! "The Year of Economy" ?????!!!!!!!!!!!! Khamenei the leader of the Islamic Republic in his Persian new year speech named this year as the "year of economy ". And the government officials after months of speech and talks about economy, did what their leader have said to do. We the Iranian people knew that; when the officials seriousely started taking about something, we have to expect otherwise and that is what exactly happened again.For example when Ahmadinejad calling his government as a servitude government or a kind government ,we know what to expect. Dear customers, dear share holders, dont worry ,we assure you that the financial embezzlement had no effect on our Banking system and we will continue to serve you. IRAN WATCH CANADA: " Beware of the promises of a desparate man"!!! Iranian People have no trust in Iranian Banks, fear is always there! More about the Greatest embezzlemet of money in the history of Iran. According to a report by Mehr News ( Raja News), Mr. Seyed Shamsodin Hoseini the Economic and Finance Minister said: "A huge violation has been occured and the Bank which issued the credit is the source of infraction." "We should have cconfronted with the Bank of Saderat and the appointed committee on this issue came to a conclusion that; the management of the Bank of Saderat must be changed." " The committee also came to this conclusion that, change must take place in Iran's National Bank and the Bank of Saman." added Mr. Hoseini. Mr. Hoseini said: "I also agree with the removal of Iran's National Bank managing director but for the Bank of Saman the situation is different, because Bank of Saman is a private Bank and we can't decide about the change in their management or to removal and appointment . " Mr. Hoseini said that, next week he is going to have extraordinary meeting with general manager of the Central Bank to see the situation of Money and credit.We will independently support the National Bank, Bank of Saderat and Bank of Saman and we promise to help all stock holders/share holders and those who have deposited money in those Bank . It seems the regime is trying to silence the officials for speaking out about this huge embezzlement. It also seems media were told not to write more about this issue. Ejeei the public prosecutor general of Iran: It is in Mr. Khavari's benefit to return to the country, so that; no charges could be laid against him !? Corrupted Islamic Republic officials are plundering the wealth of our country and our nation . This new round of corruption in the Islamic Republic ( 3000 billion Tuman money embezzlement ) is the tip of the iceberg. According to the statement by Mr. Mohammad Jahromi the managing director of Iran's Bank of Saderat ,many Banking and Goverment officials are involved in this big embezzlerment.Mr. Jahromi was the one who announced that, Mr. Mahmoud Reza Khavari the managing director of Iran's National Bank is one of the official who was involved in this big embezzlement and has escaped to Canada. In this regard , Mr. Ejeei the prosecutor general of the Islamic Republic called Mr.Khavari that; it is in his interest to return to Iran ,so that no charges could be laid against him. In another news , Mohammad Sadegh Larijani the head of the Islamic Republic judiciary power said: There is no red line for judiciary power ( saying to Ahmadinejad ,because Ahmadinejad was always threatening officials that; his cabinet is the red line and no one should pass that). He also challenged Ahmadinejad for his recent disclosure of a list of 300 names. Mohammad Sadegh Larijani said; about those names in the list, some of them are innocent , some we already dealt with and there are no record against some others. It seems that the Islamic Republic officials know sooner or later their regime is going to collaps and therefore each of them are busy plundering the wealth of the nation and filling their suitcase, ready to leave. Iran's National Bank: "Khavari has gone for an assignment and he is coming back tomorrow !??? Mr. Hosein Dashti the spoksperson for Iran's National Bank claimed that, Mr. Mahmoud Reza Khavari the managing director of Iran's National Bank went abroad for an assignment and tomorrw he is coming back. Apparently Mr. Khavari was living in Canada together with his family members when he was assigned to work in Iranian Banks. Mr. Dashti also said that he is aware of Mr. Khavari's resignation and hoped that soon another person fill his position. Alert ...The managing director of "Iran's Saderat Bank" said : Mr. Khavari the managing director of Iran's National Bank escaped to Canada !!??? Jahromi in the right and Khavari who escaped to Canada is in the left of the picture. Is Canada becoming a safe heaven for Human rights violators and corrupted Iranian officials?! With the help of Iranian Government ,Iran's National Bank managing director escaped to Canada, said Mr. Seyed Mohammad Jahromi in a statement ! Mr. Mohammad Jahromi the managing director of Iran's Saderat Bank,who has been dismissed from his post by Government due to recent 3000 Billion Tuman (1200 tuman is = $1)money embezzlement in the history of Iran ,in a statement said that, Mr. Mahmoud Reza Khavari , the managing director of Iran's National Bank ,has esaped to Canada with the help of Iranian government officials. Mr. Mahmoud Reza Khavari also resigned from his post earlier. Mr. jahromi in his statement said that; by dismissing me from my post as managing director of Saderat Bank ,they are giving wrong message to people and blaming the Saderat Bank on this embezzlement instead of elements inside the government, the central Bank and Banking network . "Based on the probability of his arrest Mr. Mahmoud Reza Khavari has escaped to Canada and currently the elements inside Government and central Bank are trying to control the damages. Now those who have given lands for a very cheap price to Mr. Mah Afarid Amir Khosravi and to Amir Mansour Arya group and has issued permits for them to open Bank and has given countries biggest projects to them without tender, must give answer to the people and judiciary power , said Mr. Seyed Mohammad Jahromi the past managing director of Iran's Saderat Bank . According to another news ,at the time Mr. Khavari was writing his resignation letter, he was in England and then he left for Canada.Based on the latest news , All family members of Mr. Khavari's hold Canadian passport and only one member has US passport. Another news suggest that , Mr. Khavari lived three days in London and then he left for Frankfourt- Germany and then since he hold a Canadian passport, he came to Canada. Bahrain police trap people in a garage and set fire to it - 23 Sept 2011- Whoever set the fire and If this is true ,it is crime against humanity ! Regime' judiciary calls human rights NGO as a " Security -Political " organization !? Narges Mohammad vise president of the "Association of Human Rights Defenders in Iran" and president of the executive council for "National Peace" is sentenced to 11 years imprisonment, for her involvement in human rights activities. Regime judiciary calls her activities as " security-Political " activities.!?! Because of her human rights activities, she is expeld from her job in "Iran Engineering inspection company".She was summond to the court ,a bail was issued for 50 Million Tuman( $50,000).Despite of paying the bail , few days later security agents entered in her home and arrested her. The court rejected her two lawyers ( Doctor Mohammad Sharif and Yalda Mozafarian ) defences as "unjustified ". Mr. Javad Larijani is the head of regime human rights delegate in UN and Judiciary power. He is silent about all of these inhuman treatment of Iranian citizens by the Islamic Republic in Iran. What he doesn't think is that ,one day his rights might be violated in the future by officials or newer regime !??!! Family's of those protesters killed after the election coup: "Our childerens were not Basiji's or saboteur" !? Family's of those protesters who were killed after the election coup in a peaceful demonstration inside the streets in Tehran and other city's said ; "our childerens were not Basiji's or Saboteur" as Ahmadinejad claimed during his round 8 participation of UN General Assembly in New York. In a press conference inside his hotel room with participation of 20 reporters , Ahmadinejad claimed that during the unrest in Iran after the election 33 people were killed , 2/3 rd of these people were Basiji's and others were supporting the regime.??!! Mojtaba Samareh Hashemi a top political advisor and think tank for Ahmadinejad in his blog post claimed that , 33 people were killed during the unrest in Iran after the election. In the past Mohammad Javad Larijani the head of Judiciary Power claimed that, only one person was killed during the unrest in Iran after the election.??!! So far, officials in the the Islamic Republic gave different account or claim about those killed in the demonstration against the election coup. Family's of those killed say Ahmadinejad is lying by telling their childeren were Basiji or regime supporters. The father of Ahmad Naimabadi: "My son left the house with green ribon on his head, two green ribon on his wrist , he also wore green shoes and it was clear he was supporting Musavi and not the regime and Ahmadinejad and i dont allow ahmadinejad to abuse my son's name." Mrs. Parvin Fahimi the mother of Sohrab Arabi (19 years old)said: "this isn't the first time Ahmadinejad is lying , i dont recognize him as president. My son was supporting Musavi and thats why they killed him." The father of Maysam Ebadi (16 years old):"
I have heard the UN representative is coming to Iran and gazzed my eyes to his coming and to tell him about the pain and agony we endur, because here ,no one is listening to us. But it seems no one from human rights organization came to Iran. " The brother of Moharam Chagini: " My brother neither was Basiji nor belonged to any Government agencies." From now on ,if the people of Iran elect their MP's,regime can oust the MP's based on their behaviour,conduct or stance towards Khamenei & his regime! In an orchestrate plan and with the help of Ali Larijani the house speaker and his deputies including Bahonar ,Majles (parliament) rattified the newly introduced article number 4 and its subsections. MP's today have passed article(bill) number 4, with 129 YES ,16 NO and 27 obstention vote out of 215 MP's present. 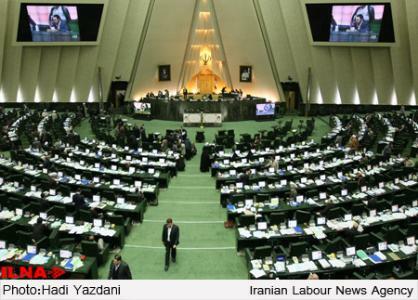 This bill is about a plan to observ the behaviour of MP's and punish them for their conducts inside Majles(Islamic Republic parliament). Based on the subsection number two of this article, The Guidance Council has all the power to cancel the credibility of the MP's ,even if the Mp's has been elected and has full support of his constituency. It's now Iranian people's turn, whether to let Khamenei's regime do what it is doing now or to stand and block or organize for a major fight back.It is important because, on March next year a parliamentary election is coming and sending a bunch of powerless or controled MP's into the Majles is meaningless. Once again journalists are under attack and this time by the Islamic Republic's minister of information. Heidar Moslehi :"The arrest of those related to BBC was just the begining and BBC is an intelligence agency." Mr. Heidar Moslehi a clergy and the Islamic Republic's Minister of Information in a new round of attack on BBC news agency , on Iranian journalists working in BBC Farsi network, and the newly arrested documentary film makers, said; "BBC is not a news agency and the journalists working for BBC are counter revolutionaries and their identity's are Bahai-Zionist and their duties are political-inteligence." In speaking with " Vahede Markazi Khabar " ( The Central News Agency) Mr. Moslehi said:" We have received important news about the colleagues and those having relation with BBC inside Iran and the ministry has summoned more of these people and is following the case. He said ; BBC Farsi is an association of counter-revolutionaries including the satanists. It is needed to add that, Regime in the past has announced its agents has arrested "a BBC network " inside Iran. Reporting from New York— In a no-holds-barred statement, two Americans who spent 781 days in an Iranian prison on spying charges called themselves hostages of sour U.S.-Iranian relations and described the screams of prisoners being beaten, the mental manipulation of their jailers, and how they lived in "a world of lies and false hope" until their sudden release last week. "Islamic Republic regime in Iran " or " Islamic Caliphate regime in Iran"? 1-Some members of the parliament including Fatemeh Rajabi (the diehard of oppressive regime ) brought a new bill into the "Majls" (Parliament) and calling that; Islamic Republic does not need president and can run by Prime Minister !????!!!! Mr. Katoozian a member of parliament speaking to ILNA told today that; some members brought this bill for approval because they believe Islamic Republic can run by Khamenei the leader of the Islamic Republic. Perhaps as Caliph and like a caliphate system. So , after all these years ,the Islamic Republic has come to the idea of Kingdom state ( with king and prime Minister ) or Caliphate state ( with Caliph and Prime Minister ) is what they need . And in Caliphate state , caliph has all the power over prime Minister ,the Parliament and Army. After all these years "the mountain gave birth to a mouse ". 2- Mr. Motahari a member of parliament with the identity known as "supporter of principles" criticized the speaker of the house and his deputies for what he called : "The speaker and his deputies are not honest and are delaying the plan to ask questions from president in the parliament"
This MP said : "At first, 100 members have signed the petition to question president, later 14 members removed their signature, but still 86 members of parliament want to question the president", but the speaker Ali Larijani and his deputies including Bahonar and .....are delaying the process. The legislation indicate that ,if 1/4th of the members decide to question the president ,it should happen w/in a month. Plan to question president came two years ago and still on limbo. Mr. Motahari warned that he will resigne if the plan to question the president won't take place inside the parliament. The way Islamic Republic regime in Iran treat Iranian people!? Regime agents removing or destroying satelite dishes from people's rooftop & home ! - It is our business what program you watch at home! - It is our business what you wear in the Street ! -It is our business what you say and what you drink ! -It is our business with whome you go out ! - It is our business what religion you have and what kind of make up you wear ! -But , Your unemployment , your safety & security, your living condition, your ability to shop , your quality of education, future of your childeren, Your safety when on the road, Your housing problem and many more is not our business !!!?????? 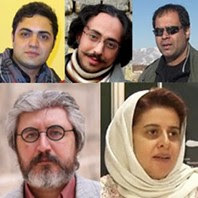 Six documentary film maker arrested in Iran! IRAN WATCH CANADA: The Ministry of Information on Tuesday September 20 announced its agents arrested six documentary film maker and accused them of working underground for BBC Farsi and receiving chunk of money from the agency.Minister of Guidance and culture called them as " Maaned" meaning obstinate(person) / the enemies . The official publication did not release the names of those arrested but the website of "Jaras" ( a website close to Khatami and Musavi) released the names and they are as follow: Mojtaba Mirtahmaseb, Naser Safarian, Hadi Afarideh, Mohsen Shahrnazdar and Katayoon Shahabi. SOURCE: Committee to Protect Journalists (CPJ/IFEX) - New York, September 19, 2011 - Iranian authorities have arrested six independent filmmakers on vague accusations that they engaged in a foreign conspiracy in connection with a critical new documentary about Supreme Leader Ayatollah Ali Khamenei, according to news accounts. The Committee to Protect Journalists condemns the arrests and calls for the journalists' immediate release. The six were arrested over the weekend, just as the BBC Persian service aired the piece on Khamenei, according to news accounts. It was not clear why the government targeted the filmmakers in connection with the documentary. The BBC reported that the film was produced in-house and that none of the six Iranian filmmakers was involved in its production. Representatives for the BBC Persian service did not immediately respond to CPJ's request for further comment. Authorities have disclosed no formal charges against the five men and one woman. 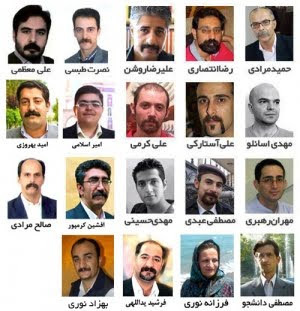 The reformist news website Human Rights House of Iran identified five of the journalists as Nasser Saffarian, Mojtaba Mirtahmasbi, Hadi Afarideh, Mohsen Shahrnazdar, and Katayoun Shahabin. The name of the sixth journalist has not been reported. After the BBC began promoting the documentary last week, the government and its allies appeared to move preemptively. In a statement, issued days before the documentary aired, which was picked up by the Iranian state news agency IRNA on Thursday, the pro-government Young Journalists' Club said the arrest of a "BBC secret network" was imminent. "Several famous individuals, masquerading as artists, who have had extensive secret cooperation with the BBC Persian Service were identified and the necessary judicial actions will be taken with regard to them over the coming days," the report said. Although officially banned, the BBC is widely available via satellite in Iran. The documentary aired on the network's Persian service as scheduled on Saturday, but the transmission was subjected to extensive interference, journalists told CPJ. "With President Mahmoud Ahmadinejad due to appear before the U.N. General Assembly, now is the time for the international community to confront Iran's relentless crackdown on independent news and commentary," said Mohamed Abdel Dayem, CPJ's Middle East and North Africa program coordinator. Separately, the family of prominent imprisoned journalist Issa Saharkhiz wrote to judiciary chief Sadegh Larijani last week to say that he has been subjected to inhumane treatment in custody, the Persian-language, U.S. government-funded Radio Farda reported. Saharkhiz's son, Mehdi, previously told CPJ that his father's health was deteriorating and that he suffered from high blood pressure, a ruptured eardrum, and a slipped disc. Mehdi Saharkhiz told Radio Farda that his father has developed a tumor that might be cancerous and that prison officials encouraged drug-addicted prisoners to attack him in exchange for drugs. CPJ has documented a steady stream of arrests, imprisonments, and politicized convictions of journalists in Iran. In the latest crackdown on critical journalism, two Iranian publications, Shahrvand-e-Emrooz, a reformist weekly, and Roozegar, a reformist news website, were both banned by the government on September 5. For more information:Committee to Protect Journalists330 7th Ave., 11th Floor New York, NY 10001 USA info (@) cpj.org Phone: +1 212 465 1004Fax: +1 212 465 9568http://info.ifex.org/Redirect.aspx? Ahmad Tavakoli member of parliament : "Mr. Poor Mohamadi who does not have phd. ( doctorate Degree ) and by lying call himself a Doctor" !!??? This is not the first time , the officials in the Islamic Republic falsely calling themselves "Doctor " ,a graduate of phd. from universities. In the past Mr. Kordan ( called himself a phd. holder ) ,several others used the same lie to deceive Iranian and foreign people. 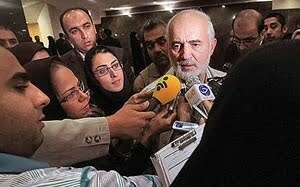 Today inside the parliament Mr. Ahmad Tavakoli speaking with reporters said that : "Mr. Poor Mohammadi never had a phd. degree and by lying he call himself a doctor ." This is another blow to the Islamic Republic regime in Iran. Mr. Poor Mohammadi is the deputy to Central Bank in Iran, which brought a greatest ever mess on embezzlement of 3000 Billion Tuman . Ahmad Tavakoli member of parliament in Iran to Ahmadinejad and his cabinet :" You dont have to suicide, only resign" ! Closed door parliamentary meeting .
" I'm telling to the Government and members of the cabinet, you who can't control and supervise your subordinates and give position to unhealthy individuals and bring the country to this situation , don't have to suicide ,only resigne" ! He was telling this straight to "president" , who knew about the embezzlement and must directly respond to the situation. When talking about suicide ,Mr. Tavakoli was refering to a Japanese situation, when there was an economic embezzlement, the Japanese high ranking person responsile commit suicide. What these "Dervish Gonabadi" have done,why they have to suffer this much? Justice will prevail and the officials of this regime will face the court of public openion in Iran ! Every human will be moved with compassion towards this much suffering of a group of people or community of Iranian known as : " Gonabadi Deravishes" , who have been under alot of pressure and harrasment by Islamic Republic regime in Iran. "Dervish" believes living a life in its mystic way and modestly.They have lived their lives peacefully for centuries in Iran.Many years ago agents of the Islamic Republic regime in Iran, attacked on one of their leader's home and arrested and detained Ayatollah Kazemini Brojerdi, despite of protest by his followers .Since then and every now and then, there were news about the arrest or detention of a "Dervish " or destruction of a "Dervish Gonabadi" praying place in the news. I dont know what to say to this regime !? it seems ,this regime can't stop making more enemies for itself and has to creat chaose among every communities. One thing is clear , this regime doesn't know how to manage the country.One may say ,they have managed the country for almost 32 years now!? Yes, this is true, but in what price? Iranian people ,particularly the young Iranian or the new generation of Iranian less and less believe on Islam and this regime in its entirety. Doctor Mostafa Azemayesh the spoksperson for "Gonabadi Nematolahi Dervishes" said: Regime has intensified recently the wave of arrest and detention of Dervishes in Iran. in another news,in a systematic attack by regime thugs and agents to Dervishes community near Shiraz city Vahid Banaei a member of Dervishes was killed by agents and many wounded or arrested and detained.Regime agents have also arrested and detained dervishes lawyers. Because of the wave of attack , arrest and detention of the Dervishes and their lawyers, the dervishes are staging a gathering in front of Evin prison on Monday September 19 ,in protest to the wave of arrests , detention, harrasment and treatment of Gonabadi Dervishes inside the prisons. Recent protest of people in Tabriz city about the dying of Orumieh lake and regime's Sepah & basiji forces-9/3 /2011-Many are arrested and detained . When judge himself start lashing a young religious woman blogger ! IRAN WATCH CANADA does not writes about himself or for himself ,but dedicate its time to voiceless people particularly the brave Iranian political prisoners! 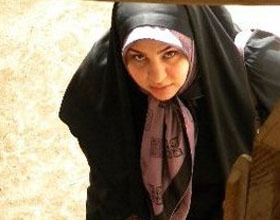 Touhidlu is a doctorate degree student in sociology of Tehran University, who was arrested and spent 70 days in solitary confinenment and was sentenced to 50 lashes for what she was accused of.Two days ago, she attended in Evin prison for execution of the sentence. Many officials were present including the university president, the judiciary officials ,the ministry of information officials and many women working in the public prosecution office.When judge asked the women employed at public prosecution office to carry out the execution of lashes on Samieh's body , they all rejected the request and no one volunteered to do this inhuman act on the body of a moslem women student. So , the judge himself carried out the execution and by doing so,brought huge protest among religious and non religious and human rights defenders.Based on the Islamic Republic legal policy , it should have been women to carry out the execution of lashes on a woman, but here a man and most particularly a judge carried out the execution. Regime in the past have done this kind of acts deep inside the torture chambers and without media coverage.This time,but the story was different and women at prosecution office rejected judeges request to carry out the lashing on a young moslem girl. Syria - Al Wa'er Homs Pro Democracy Rally Unites Muslims and Christians. More than 80 Iranian poets and artists in a letter protested against the judiciary power on the arrest and detention of many Iranian artists. In their letter ,they wrote: "Today it is correct, if we call Evin and Gharechak prison the house of artists." In the letter they have protested against the arrest and detention of Iranian artists such as : Marzieh Vafamehr, Ramin Parchami, Jafar Panahi,Mohammad Rasoulof ,Mahnaz Mohammadi, Maryam Majd, Pegah Ahangarani and Hila Sedighi and many more. The signatories in their letter wrote: "Time to time assault on Iranian independent and thougthful artists " . The signatories demanded for the release of detained Iranian artists, review in their judiciary process and have criticized regime's security-policing style treatment of Iranian artists. The letter indicated that, only in last july several Iranian women artists including Marzieh Vafamehr (Actor) , Pegah Ahangarani( Actor) and Mahnaz Mohammadi ( Documentary film maker) were arrested by Islamic Republic agents. In an interview with Radio Farda Mr. Naser Taghvaei ( Film Director and husband of Marzieh Vafamehr) said: his wife is detained at "Gharechak-Varamin" prison.This prison is known as " horrendous prison".This prison is consist of seven cells and in each cell there are 200 prisoners and the cells doesn't have air ventilation system. Islamic Republic regime and attack on human rights whistle blowers ! "Up to now 29 lawyers have been arrested or forced to leave the country",Said Mohammad mostafaei the Iranian lawyer and human rights defender who left Iran and currently live in Norway. Nasrin Sotoudeh the Iranian lawyer and human rights defender is sentenced to six years imprisonment and 10 years ban from practicing her profession as lawyer.The sentence was given yesterday by division number 54 of the court of appeal to Mina Jafari one of Sotodeh's lawyer. A few days ago Mr. abdolfatah soltani an Iranian lawyer and a human rights defender was also arrested and detained by the Islamic Republic judiciary system headed by Mohammad Sadegh Larijani. "The goal of the Islamic Republic by putting pressure on lawyers is to break the spirit of the political prisoners. The Islamic Republic by arresting and putting pressure on lawyers want to send a message to all lawyers , so that no one will defend the political prisoners." said Mr. Abdolkarim Lahiji an Iranian lawyer and a human rights defender currently living in Paris. Iran and Iranian prisoners of the Islamic Republic regime ! "You are detained until proven not guilty" !? The Mother of all prison in Iran is Evin prison in Tehran. Iran and Iranian are taken hostage . Regime has built and developed many many prisons around the country. Everone visiting Iran ,in every provinces or cities,must know that; the revolutionary guards (Sepah) has its prison , the Ministry of information (Vezarate Etelaat)has its own prison, the prosecutors has its separate prison and ....all starts from international Airport ,from its prosecutors office at the Airport. But the mother of all prison in Iran is the Evin prison at the footstep of Albors mountain in Tehran. Most recent year execution of drug dealers and ....took place here. This Islamic Republic regime has also habit of transfering political prisoners to internal exile - to a more remote areas of the country. IRAN WATCHCANADA one of the serious blog which brings to you painful voices of the political prisoners in Iran . 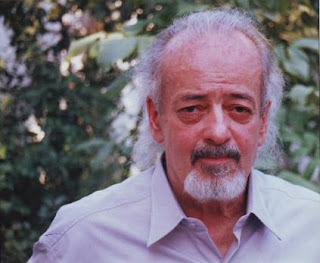 The moving letter of Mohammad Maleki to honorable Ahmad Shaheed the UN human rights reporter on Iran. Excerpts from Mohammad Maleki's letter to Ahmad Shaheed. Hello and greeting ,wishing you success for this great and humane job, you have accepted. I'm doctor Maleki, the retired professor and the first president of Tehran University after the revolution.I wanted to inform you a short account of my own personal experience i had about violation of human rights in my country, in order this would become a step towards saving my nation from all these oppression , corruption and cruelty of the rulers on an oppressed nation. I'm also like many of tens of thousands during 32 years of the Islamic Republic ruling, many many times my very own human rights was violated by the power thirst despotic ruling oficials and i was witness to many crimes inside the prisons in Iran,that i'm going to give a short account. In 1978-79 upon the victory of revolution and after my nomination as president of Tehran University ,and towards the goals of revolution ,i decided the university be managed by a councile consisting of students,professors and employees in a democratically elected fashion. The new government which took control of the entire country didn't like this idea , and by a coup known as " cultural revolution" attacked the university's , killing several students and wounding or arresting many of them, closing the universitys and arresting many of those protesters and torturing and executing them. I will testify about the 80's, how the young prisoners including students men or women,after a lot of torture ,were carried away ten by ten or hundereds by hundereds for execution.I'm ready to testify to you about what i witnessed in the "Velayate Faghieh " system and ready to pay the price. At the end ,i wish you success on your job and surly God will be w/you. Political prisoner w/suspended sentence and retired professor of Tehran University. 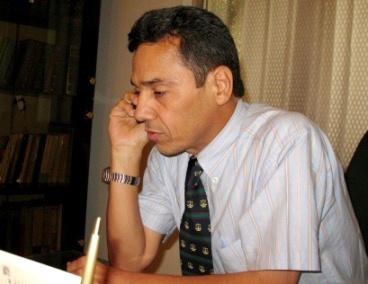 Abdolfatah Soltani a lawyer and human rights defender is arrested again. Abdolfatah Soltani is a prominent lawyer in Iran . He is a member of the Association of Human Rights defenders in Iran and a board member of the Association of Lawyers in Iran. This morning the security forces arrested him and transfered him to an unknown location . Maedeh Soltani the daughter of Abdolfatah Soltani said: "My father was arrested when he was doing his job at the court of revolution. Four agents arrested my father and then took him to his office, hew didn't have key to the office and the agents broke the door and entered into the office.I dont know what kind of document they took with them. Then, they brought him to our home and searched our house for two hours and took cameras and other items with them and when my mother protested , the agents said: we are looking for documents about the Association of Human Rights Defenders ." A few days ago Masumeh Dehghan the wife of Abdolfatah Soltani was summoned to the court and was arrested and spent a few days in the jail. She was told " why she did attend to receive the human rights award on behalf of her husband." Later she was released on $30,000 bail and this file is still open. The judiciary arrested her to put more pressure on her husband and his activities. IRAN WATCH CANADA :Mohammad Sadegh Larijani the head of Islamic Republic judiciary must answer for these crimes against humanity in International court and people's court in a future democratic Iran. Iranian execution of three men on charges of consensual homosexual acts brings attention to persecution of sexual minorities and increasing use of death penalty in Iran. Iran has the highest rate of executions in the world per capita, and reportedly has had a surge in death sentences undertaken this year. In July Just Journalism gave coverage to video released by Amnesty International showing a public hanging in Iran, which prompted condemnation of the Islamic Republic’s increasing use of the death penalty. The full video can be seen below [warning: graphic]. IRAN WATCH CANADA : Interpreted in memories of all those who have lost their lives. You won't be forgothen. 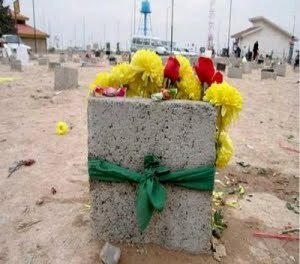 Greeting to those who aren't with us now,and we came here to see them but couldn't, this is "Beheshte Zahra" (Cemetery-Int..),September 9,2011,We have come here on the tomb of Mohammad Mokhtari,Dear Mohammad Mokhtari,One of those who was killed on 15th of February ( During protest after presidential election coup almost three years ago-Int..) ,We have had promissed to be here on his birthday, on his birthday, many have promised,many have planned,this to happen , but unfortunately we have come and faced w/ a several.... , what shall i say to them,what shall i say,i'll tell them oppressor, whatever i tell, still lacks their description,we came here and were confronted w/ several oppressors, several filthy opperessors, didn't let, didn't let anyone go on his tomb,didn't let anyone go on his tomb, dear friend : They didn't let anyone go on his tomb,anyone came were arrested and carried away,I saw one with my own eyes was taken away,No one were on his tomb , even his family were not allowed to go ,I don't no may be they have come in the morning or lunch time but it was planned to attened at 5:00pm . No one was on dear Mohammad Mokhatari's tomb except the police forces and the filthy Basiji's , the end and no one was there. I dedicate these flowers from this distance to you dear Mohammad Mokhtari , we couldn't gather at your tomb, we have brought these fluttering flowers for you to lay on your tomb, to pour on your tomb,on your tombstone,they didn't let us to do that, they didn't let us,but from here i send my greeting to you, all of us here send our greeting to you,send our greeting and we want our country to become free, only for your sake and people like you who have lost their life , hoping for that day. Today - 9 9 Binnish, Idlib 3-Syria -International community open your eyes and ears and protect civilians now ! 9 9 Anadana, Aleppo.This is the story in every Syrian city's.The Arabian spring-protest in Iran and Syria took away the sleep from dictators! Bashar Al Asad secret meeting with Islamic Republic regime in Iran! 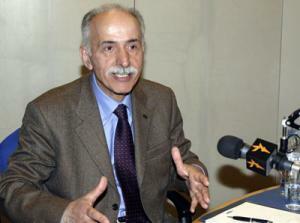 The Syrian opposition must beware of negotiation with Bashar Al Asad . Buying time and finding strategy and tactics, is what the matters here or exhausting the oppsition and their protest ,and finding out why the Islamic Republic regime officials particularly Khamenei-Ahmadinejad is calling Bashar Al Asad to get closer to Arab leaders, start reforms and negotiation with Syrian oppositions?. "Divide and Rule" is may be the plan or Scenario here. It was reported that Bashar Al Asad came to Iran to discuss issues sorrounding the crisis and problems he faces in Syria.He met khamenei - Ahmadinejad. In this meeting, Khamenei asked bashar Al Asad to get closer to Arab leaders and follow their suggestion for Reform and Negotioation with Syrian oppositons . syrian revolution .look how the police torture people in the street. New round of protest in Iran , this time started from Azarbayejan ! People of Azarbayejan protesting against regime policies ,particularly about the dying of Orumieh lake! According to the news protests have started in the city of Orumieh in Azarbayejan province. It sterted a little bit after 6:00pm on Saturday (today).The protest started from Ataei and Imam streets. The city center is in the hands of the people. Until this time, there are no news about clashes. SMS and mobile phones lines are cut off by regime ( The revolutionary guards are owner of telecommunication ). People in the city of Tabriz has also started the protest.This protest brought many thousands of people into the Streets.Clashes has been reported between the people and regime forces in Shahram and bahar streets.Clashes have been reported between people and the regime forces in Central Square and motahari Street. The witnesses saw regime using plastic bullets in Tabriz city to disperse people. The clashes between regime forces and people are severe in Zanjir Square in the city of Orumieh.The clashes have reached to the provincial Government building of Eastern Azarbayejan and Shahnaz intersection. Report indicate that, there have been sound of gun fire in Ferdousi and Amin crossing in the city of Tabriz. If you are student and you criticise the Islamic regime in Iran,you will be expelled from school and deprived from education and sometime face death!? Iran watch Canada will bring you the voice of Ashkan zahabian and many like Ashkan's ! Bahai students are deprived from higher education in Iran ! Students critical to the Islamic regime in Iran are expelled from school. Furthermore , if they continue criticizing the regime, they receive a star beside their names or more stars if they dont listen and keep quiet while in the campus .This trend continue with threat , intimidation not only to students but also to their familys and jail, torture or death closes the game between the regime and the students.This is the tragedy which the Iranian students face in the Islamic Republic regime in Iran. This situation reminds me of my student years in the philippines (1976-1982)under Marcos dictatorship. At that time , i, together with several other students in University of the philippines, organized a class boycotte against an increase tuition fees. My picture was taken at the protest by the university guards , and the next semester when i was enroling , i found out i'm black listed and was asked to go to the guards office and clear the situation. The chief guards threatened me if i continue the protest or if i write anything in university, i'll be expelled from university and from Philippines. What makes different between Marcos and Khamenei's regime? I do not know how many Iranian students are currently expelled by the Islamic Republic regime in Iran . Or how many of them have stars in front of their names. One very tragic situation is the situation of Bahai students , who are deprived to enter into universities to continue their education. As a result of this disastrous policies, many Bahai students have decided to continue their education at their homes with their own teachers , but regime even does not tolerate this and have banned their education in its totality.It is needed to say that, Bahai students believe, they do not even enter into the politics of Iran. In the news today , i red about Ashkan Zahabian a student of Ferdousi University in Mashhad city. Ashkan was a former member of the Islamic Association of the university. He is in "Matikela " prison in the city of Babol. In protest to his illegal and arbiterary arrest and detention, he started hunger strike since yesterday and his health is deteriorating . Instead of transfering him to prison clinic ,the prison officials brought him to a solitary confinement.Four months have passed since his last arrest and judiciary system is doing nothing to release him from prison which he does not deserve.